Even when you’re shrinking, the wrap dress is one of the few items in your wardrobe that can come with you on your adventure little worse for wear. 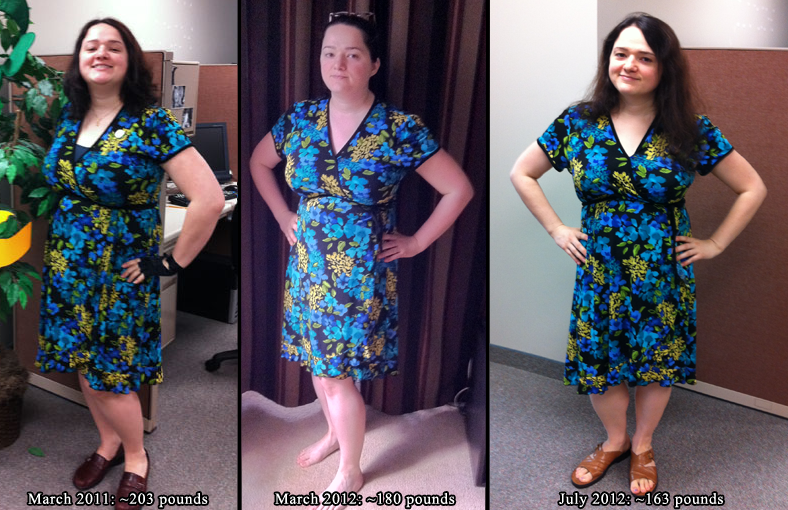 Wrap dress on three versions of me. The third image is from this last week. I don’t look as radiant as I mentally feel because I was much under the weather. It’s hard to practically prance around as if reenacting “The Sound of Music” when you’re weakened and in constant discomfort. But science is fixing me, and I’ve felt much better for several days. I may have to postpone my plan to do a pilates-to-c25k program, pending doctor’s treatment and approval. Yes, this was all done with moderate exercise for the first year, then lower carb, paleo-ish food choices from February 2012 onward. It wasn’t fast, but it happened. And I can still wear one of my favorite outfits! Halleljuah. This entry was posted in clothing, health, weight loss and tagged clothing, goals, health, motivation, Photos, results, weight. Bookmark the permalink. Love it!!! Headed out to TJ Maxx, Marshalls, Burlington and Ross TOMORROW!